In the last twenty years professional golf courses have been built throughout Niagara Falls, offering yet one more attraction to tourists. These golf courses all offer something a little different but they all maintain professional designs, great club houses, pro shops and a great day out on the green. 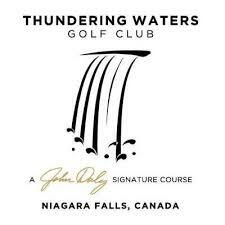 Thundering Waters is John Daly's first "signature" golf course in Canada located within the Niagara Falls' Fallsview Tourist District and a mere 1,500 yards from the Horseshoe Falls. Designed in collaboration with Canadian golf architect Bo Danoff, Thundering Waters reflects John's risk-for-reward style of play on a course that combines parkland tranquility of Augusta National with the heathland treachery of British Open Championship golf. The par 72 Thundering Waters is a match for players of any caliber. Legends on the Niagara Golf course is a one-of-a-kind course, with 1,000 acres of natural landscape that boasts two 18-hole championship courses, a 9-hole short course and an incredible 45-acre, 360 degree, driving range. Each course is designed to offer something different, providing a wonderful mix from open holes where golfers have to negotiate fescue and sand traps, to parkland holes that wind through trees and water hazards. Grand Niagara Golf Course designed by world-renowned golf architect Rees Jones, and is ranked the best public golf course in the Niagara region. The course captivates and challenges players of all levels. It's a centre 5, 737 years from the forward tees and a daunting 7, 425 yards from the championship tees. Bordered by the picturesque Welland River, Grand Niagara echoes the ambience of the world's classic courses.